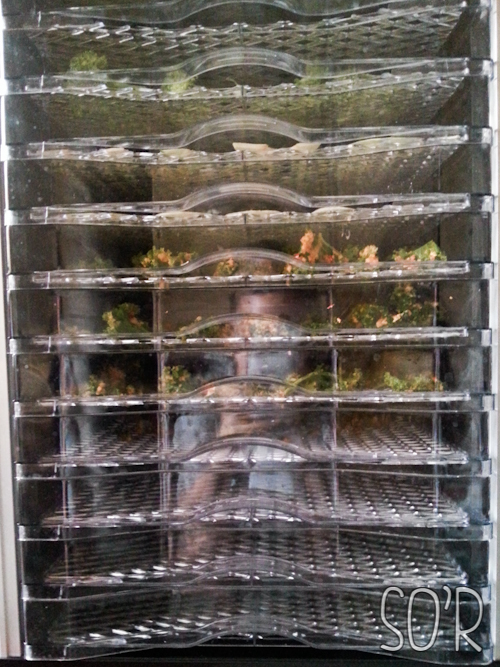 Seasoned Kale in the dehydrator along with other veggies my mum is dehydrating. Recently I found a fitness website called Blogilates. It is getting rather popular on youtube right now with many success stories, healthy recipes, etc posted on their website. While browsing around the “recipes” section, I found this recipe for Kale Chips and Cassey (the owner and host of Blogilates) said that it tastes like Doritos! And it’s KALE! A super-food I hear there’s heaps of benefits from eating kale – some a little unbelievable. But if you want you can do a quick search on google or read this. I gave up eating deep friend around 5 years ago but I still gave in when it comes to potato chips and Doritos until about a year ago. If this recipe is a success, not only can I eat this healthy snack, but I can also share this with my family and promote a healthier diet. So I have high hopes! Since my family and I were going to go travel for 2 weeks, we had to “clean out” our fridge – meaning buy nothing new and eat what’s there. We still had a bag of kale left and didn’t know what to do with them since that was our first time seeing and buying Kale. So I decided to make kale chips. I followed Cassey’s recipe except for the fact that we didn’t have any sunflower seeds nor cashews as suggested by the source recipe – we only had peanuts, so we used that instead. After dehydrating them for about 4 hours (we left it a little longer since we were out of the house for a couple of hours to do some last minute shopping for travel) they came out about half the size and super crispy! I think that’s what we’re going for? The taste? Um… a little weird… Mine didn’t turn out to taste like Doritos, possibly because we used peanuts. But hey, still edible and pretty yummy. One thing I found weird in the recipe was that on Cassey’s blog, it says if I use the oven to bake it for 5 minutes, toss then bake for another 5 but on the source recipe that Cassey mentioned, it says to bake for 3-4 hours. What a huge difference! Let me know if any of you tried baking them. If you are in Perth, Western Australia and looking for nutritional yeast and you are not in a hurry, I definitely suggest to try order them online. I think I saw a 500gr packet for just under $20 and a 200gr packet for about $11. But I was in a hurry, so I bought mine at Pharmacy 777 in Cottesloe. Anyway, I hope you like my little review of this recipe. It was definitely an adventure trying to find “Nutritional Yeast”. I hope it was useful know how I did mine and maybe (just maybe) inspire you to go eat healthier alternatives to over-processed foods. Have you tried making Kale Chips? How was yours? My Crazy Week and a Half! Current Loves: Cheerios and Soy Milk?